Y’all. Seriously. This DIY: Bit Box tutorial has been in the works for DAYS… ok really, weeks. I started it before my bout with the death flu, then the monsoons came and killed whatever ounce of motivation I had. But – IMHO – it was worth the wait! 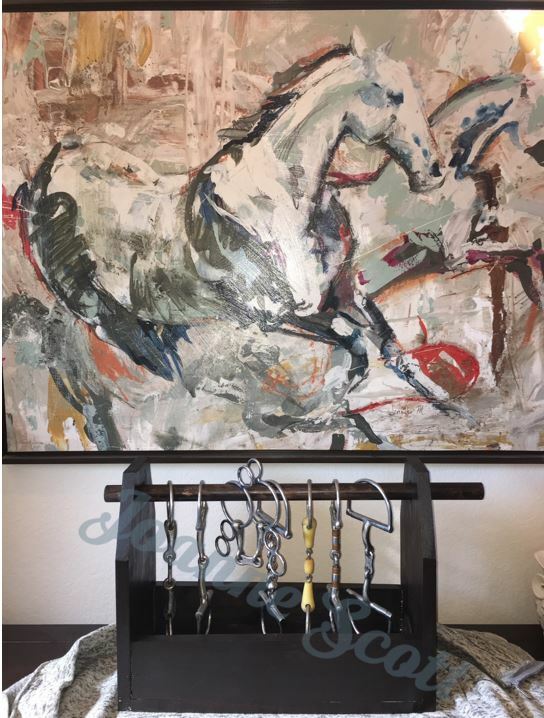 I have a few tack trunks… My big Burlingham tack locker and the DIY rehab Warner’s trunk live at the barn… and I have a handmade tack trunk in my garage that is too sentimental for barn life… plus a few Rubbermaid totes and a Stanley-type trunk that also reside in the garage. Alas, with all of these options, I didn’t have a practical way to store bits. 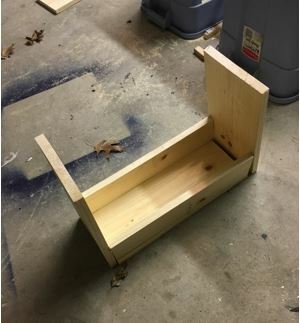 I modeled my bit box after a grooming tote that I had in my aforementioned garage-tack room. Mr. Power Tool, aka my husband helped me make the cuts. We used 1 8-foot 1×8” for this project. 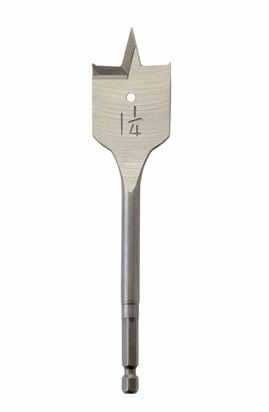 All of my bits are 5” – 5.5”. If you have bigger bits, hang one from the dowel and measure how far your hang will be. You can make your sides taller than 14” if necessary! 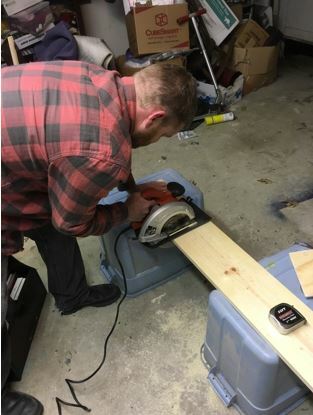 You can use a regular saw if you don’t have a circular saw available, or Home Depot/Lowes will make your cuts for you for a small fee (usually $.25 – $1 per cut). Bonus: get your husband excited about horse projects by offering use of power tools. ONCE AGAIN, readers, I beg you… please do not be jealous of my super clean and very organized workshop! Once our cuts were made, I did a quick dry fit to make sure all the pieces were how they had been imagined in my head. The side pieces fit to the outside of the base and the side pieces sit between the side pieces, on top of the base. Here’s where the project went sort of hay-wire. I can’t pretend DIY isn’t some FIY (Fail It Yourself?). I wanted angled pieces on the top and… it just didn’t work. I wanted a longer angle so we couldn’t use the chop saw and instead tried a hybrid of chop saw and hand saw and it was just… bad. I only had one 1×8” to work with, and it was gone. Then the flu hit. And I just left the pieces in the middle of my garage and forgot about it for a while. Flash forward, new 1×8” purchased and cut again. We used our chop saw to make shorter angles which turned out really well! If you want a more decorative top to your box, you could use a jigsaw for a fancy shape. Creativity, it just wasn’t with me. 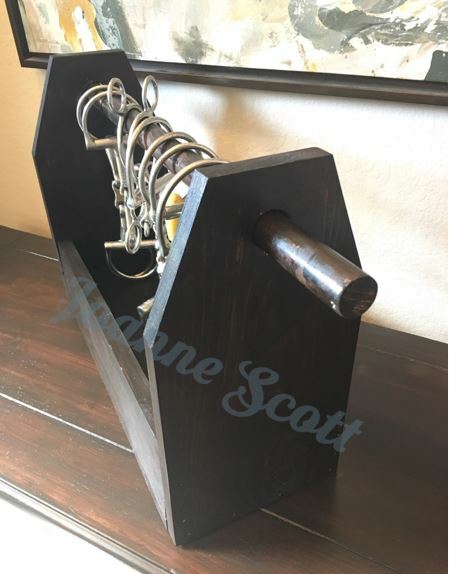 The newest piece of hardware to my collection is this weird thing called a “wood boring bit.” It will drill through wood to give you a nice, perfectly cut hole! This is where your dowel will go to hang the bits on. Note, make sure you buy the correct size bit that corresponds to your dowel size. My dowel was 1” and my boring bit was 1 1/8”. The little extra allows the dowel to move more easily. I spaced my holes 1” from the top of the side pieces. Since my pieces were now all correctly cut, I used some wood glue and clamps to get a base assembly going, using my fancy Rubbermaid totes as a table. 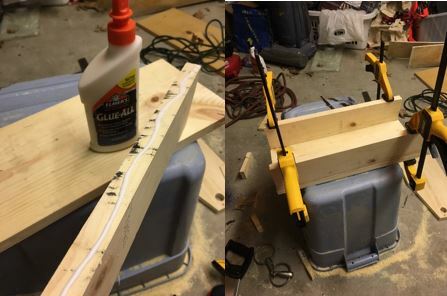 I completed assembly with my nail gun, striking into each connecting edge… and voila! I applied 2 coats of leftover stain that I had on hand for the finished product. 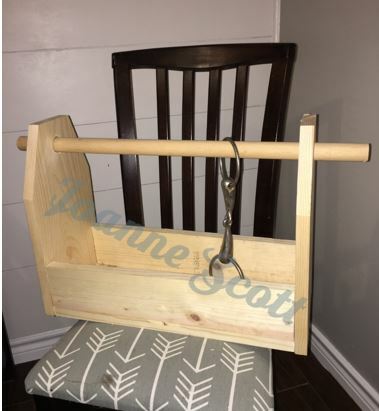 I’m pretty pleased to have a nice looking addition to my tack collection, and it’s a cute equestrian décor item! You could also modify this plan with taller sides if you weren’t cheaping out with one piece of wood, like I *attempted* to. Hunky Hanoverian would love to hear if anyone attempts this on their own! Do you enjoy these DIY tutorials? Anything you’d like to see in the future? Leave your comments below! I would love to say this painting is DIY, but it was purchased several years ago at Garden Ridge, which is now At Home. Lol I just keep buying more bridles, so I just need more bridle hooks because all my bits have a bridle to live on! Oooh! I like the idea of using bits for interior design. I’ve spent enough money on them, I might as well show them off! I keep sending my dad pics of a box style bit box, but sadly nothing has shown up under the Christmas tree. I have a zippered bag from the dollar store that I use to keep my bits in. Not nearly as nice. I don’t own enough bits for this, but I think it is awesome. Maybe a fun trainer gift! I’m sure I can find plenty of random bits not in use around the barn. That was my first thought too- trainer gift! I will definitely keep this in mind in the future, I absolutely love it! Omg what a good idea. I am so making my boyfriend help me with this!